Millennium Plaza Dubai, a luxury accommodation along Sheikh Zayed Road, is currently witnessing an extensive renovation in its lobby, with a chic refurbished earthly brown and yellow palette, bringing a fresh new look to this city property. The reception desk which is the first point of contact will be an individual pod allowing front desk associates to be more interactive and have more personal communication with guests. The reception area has been designed to provide an elegant, light, spacious and modern new arrival point to the hotel. Additionally, the concierge desk will be centrally located and easily accessible for guests. In keeping with “More Than Meets the Eye” motto, the new lobby is designed to offer a more relaxing and inviting atmosphere, creating an everlasting impression for guests. It also features wider seating areas where family and friends can gather while waiting to get checked-in or checked-out, and business travelers can find a quiet corner to check emails and return calls. 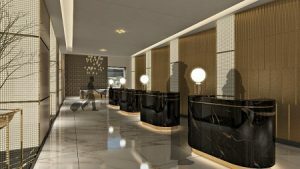 When the renovation is completed, the new lobby will feature an open-plan concept, connecting the reception to other facilities in the hotel. These enhancements will bring an added element of style to Millennium Plaza Dubai. The new lobby is part of the ongoing renovation project at the hotel which will also see the addition of two new restaurants and an elegant and luxurious Presidential Suite. A well-known brand specialty restaurant and a Coffee Lounge will give guests more dining options and a Presidential Suite is being built to cater to the increasing number of families and affluent travelers who are looking for spacious accommodation alongside luxury and a full range of business and recreation facilities. Millennium Plaza, located just next to the Emirates Towers metro station is the perfect base from which to explore the city. With a prime location, the hotel is located just a few minutes’ walk from Dubai World Trade Center and Dubai International Financial Center and near Dubai Mall and the city’s popular attractions.